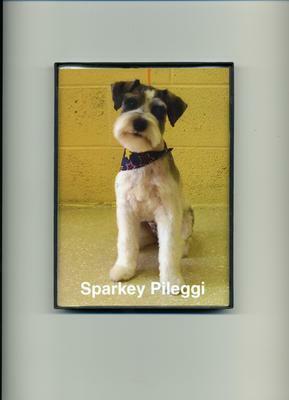 SPARKY IS A 2 YR OLD PARTI SCHNAUZER BELONGING TO BARBARA AND PATTI WHO ARE SISTERS. HE IS SO LOVABLE AND LOVES TO KISS HIS MOMMIES. HE LOVES HIS CRATE BECAUSE THIS IS HIS KINGDOM. HE HAS SO MUCH ENERGY!!! HE LOVES TO RIDE IN THE CAR AND IS NOW GETTING USED TO HIS LITTLE WALKS. AT FIRST WE WOULD PUT THE LEASH ON HIM AND HE WOULD JUST STAND THERE LIKE A STATUE. HE'S SO FUNNY. AT NIGHT WE HUM THE LONE RANGER AND HE RUNS THROUGHOUT THE HOUSE. I WISH THAT I HAD HALF HIS ENERGY. HE RECENTLY HAD A LUMP REMOVED FROM HIS GROIN AND HE HAS A COLLAR AROUND HIS NECK TO PREVENT HIM FROM LICKING. SO FAR HE'S DOING WELL. WE LOVE OUT SPARKY BECAUSE HE PUTS A LITTLE SPARK IN US ESPECIALLY IF WE'RE DOWN AT TIMES. I WANT TO SHARE HIM WITH YOU. THANKS, BARBARA AND PATTI AND OF COURSE MR SPARKY. Note from Linda and Max: He certainly is a handsome fellah and sounds like he is full of character. We love the idea of him running like crazy round the house to the sound of the Lone Ranger tune! Every Schnauzer is unique, it's no wonder they capture our hearts. Comments for SPARKY THE MAGNIFICENT!!!!! I have just read the story about Mr Sparky , how lucky are those ladies(Patti and Barbara) that love him and care for him. I really miss having a dog as my companion and as I will be moving soon I will be looking for a Schnauzer to come and live with me and be spoilt!!!!! Sparky is absolutly gorgeous, I love him. Thank you for sharing your picture with us, if you love Schnauzers to see other Schnauzers brightens up your life.